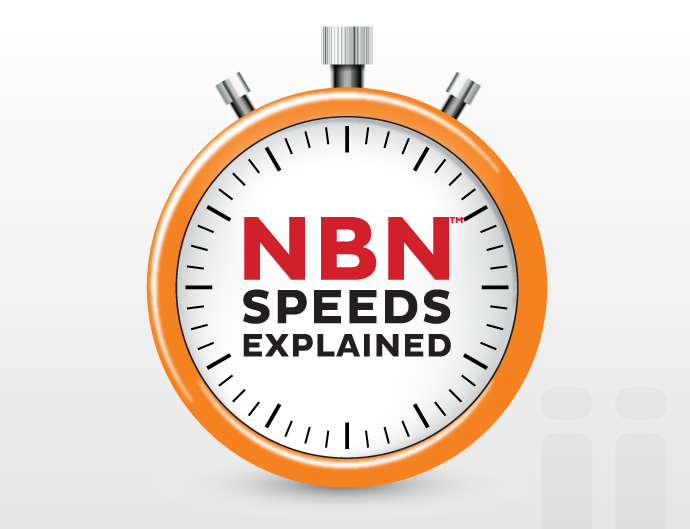 In order to help Australians make informed choices when it comes to the NBN™, iiNet is amongst the first Internet Service Providers to follow recommendations from the Australian Competition and Consumer Commission (ACCC) to move away from unclear language such as “up to” when describing NBN™ speeds. Basic: Between 5 – 12Mbps download, 1Mbps upload. Boost: Between 5 – 25Mbps download, 1 – 5Mbps upload. MAX: Between 12 – 100Mbps downloads, 1 – 40Mbps upload. These ranges are based on information supplied by our wholesaler, NBNCo. While iiNet has always endeavoured to provide the best experience to our customers this can be challenging as NBNCo itself does not guarantee minimum speeds at a wholesale level. Providing information about the speeds customers can expect to experience on any internet technology is a lot more complicated than it may seem. There’s a huge number of factors which could affect speed along every step of the physical and digital network path. When you consider the complexity of telecommunications networking and how internet data gets from A to B, it’s virtually impossible to provide an exact speed, so a range is more realistic. As explained in Connecting to the NBN™ Network, NBN™ FTTN/FTTB services use copper cabling to connect the customer’s premises to a Node or Main Distribution Frame. You can check the NBN™ technology available at your address on our website. The length and quality of this copper cabling has a significant effect on the customer’s connection speed, particularly in areas where NBNCo has installed fewer Nodes than originally planned, resulting in increased cable length. Additionally, NBN™ FTTN/FTTB networks will typically run slower during the 18 month transitional period (known as the coexistence period) after NBN™ first goes live. This is required in order for NBN™ FTTN/FTTB to coexist with legacy non-NBN™ services. After 18 months, legacy copper services are typically disconnected and NBN™ FTTN/FTTB performance improves. iiNet NBN™ customers were found to be the most satisfied in two independent, national surveys (details here and here). As such, iiNet has a serious commitment to providing the Australian public with the information they need in order to make informed decisions when choosing an NBN™ plan. We’re currently investigating ways to provide even more detailed speed information to customers when they make an enquiry about the speeds they can expect at a specific address. The ACCC is also developing guidelines about communicating “peak speeds”, which would refer to when network congestion is typically at its highest. iiNet will be working to these guidelines once they are published. The ACCC is also currently seeking volunteers for a broadband monitoring program across NBN™, ADSL and next-generation fibre internet services. For more information about the program and how you can express interest, visit accc.gov.au. Whilst I understand the the realities in the variability of speeds what I think is unacceptable is billing for a 25mbps plan and the performance doesn’t meet the minimum of that plan. For example I am on a 25mbps plan but for at least one occasion what I was getting was only around 7mpbs (probably due to GOT streaming). My opinion is that if that there should be a recourse to the customer if performance falls into the tier below what they are paying for. Hi Garin, like all Internet connections it is impossible to guarantee that you’ll receive maximum speeds at all times. However if you are concerned about the speeds that you are receiving I would encourage you to get in touch with our support team on 13 22 58 so that we can troubleshoot your service and identify any issues that may be present. connection which Inam still waiting for. Please delete the $20.00 added to your latest account and advise me when you have done this. Hello Georgina, for any concerns relating to your account I would recommend contacting our billing team on 13 22 58 so that we can assist you further. We have read identical information in the press. What customers need from iiNet are data about actual real-life average speeds being experienced by, say, postcode areas. I am sure iiNET has access to resultant speeds being delivered or at least historical data. Any scraps of information will in my eyes lift your standing considerably against other providers keeping such data close in-house. I recognise the commercial implications but are not customers entitled to see the product they are purchasing? My local Federal MP invited me to a forum on the NBN recently. As I was unable to attend, I sent him the following email. Thank you for the invitation to the NBN Forum in Gawler next Monday. As I will be in Melbourne all next week, I won’t be able to attend. You may be interested in my NBN experience. keep my current email address and home phone number. I also decided to upgrade from my prehistoric Nokia to an iPhone and was able to retain my current number. Early in January, I received a new modem plus instructions and all the necessary bits and pieces. A few days later I was invited to book an appointment for the connection. As my connection was fibre to the node, I didn’t have to install any additional cabling or connection points. The connection was made just after 11:30 a.m. on January 17th. I meticulously followed the set up instructions, double checking each action as I completed it and was on-line with the NBN before 12:00 noon. After a short lunch break, I returned to my computer and received an email telling me my Netphone service was ready to activate. Once again, I meticulously followed the instructions and had my three handset plus answering machine system set up by 1:15. The only change I had to make was to move the base unit closer to the modem. By 2:00, my iPhone was set up and operating. I found the whole process relatively easy and quite painless. My download speed is greater than 23 mbs and upload speed greater than 4.5 mbs. I find these speeds more than adequate. I have not experienced any difficulties or faults and I am very happy with the service which costs about the same as my old plan. I know there are some unhappy customers, but my experience has been 100% positive. Friends who attended the session tell me it was nothing more than a complaint session enjoyed by the nay sayers who are impossible to satisfy. Anyone with positive comments found it difficult to make themselves heard. We don’t have a 50/20 plan as we’ve simply had no demand for this option. We’ve chosen to simplify our product offering down to three speed tiers to suit our customer demand. Sorry to hear that your speeds aren’t what you were expecting. We’d strongly suggest having a chat to Support about this, so they can investigate and troubleshoot for you. I have cable for internet and TV. With all the issues around NBN, I will wait as long as I can before switching. Right now I get good performance. So where is the 1Gbs that I want? Oh that’s right. The NBN CEO thinks we don’t need it. Fairly satisfied with speed increase from prior ADSL2+ (7.64Mbps D & 0.96Mbps U) to present 25/5 plan on NBN (23.12Mbps D & 4.75Mbps U). There is a 600m copper run from local Node, and the wiring at the Telstra footpath pit is “duct taped” out in the open. Am able to enjoy Streaming Service, or CatchUp tv, with Chromecast connection. I put up a tower with an antenna on each of two properties approximately 60 kilometers apart. This allowed me to remote desktop to the properties using fixed wireless broadband as ADSL was not available. The service was great with the exception it was restricted to 12Gb download/month. However, it was still possible to connect to the properties and work without issue. Along came nbn. One property was connected via fixed wireless and the other via satellite. What an utter disaster!! The latency is absolute pathetic! The latency on the satellite is ALWAYS in excess of 600ms! Try controlling a cursor on a remote site with that sort of latency. The satellite link goes from the southwest of WA to the NSW ground station to the Perth fixed wireless server to the southwest of WA again! And that is plus the 600ms+ latency of the satellite!! Talk about going backwards!!! Whomever thought satellite was suitable for internet protocol needs their head read! And, when we signed up for the packages, it was 25Mb download and 5Mb upload, not as now, between whatever and whatever for whatever package!!! Talk about a ripoff!! Not at all happy! A high price to pay for more Mb’s!!! I have had internet from different service providers and different plans, I have never received optimum quality, all of them seam to be the same poor quality no matter if I pay more or less. I guess NBN system will be the same situation because it will work on the old wiring telecom net. It really does depend on what service you end up with, the quality of the infrastructure as well as the network and your choice of provider. There are many variables here! We certainly encourage you to take a little time to research what could be available to you and weigh up the pros and cons. We’ll do our best to help you where we can! This is why everyone is suspicious of NBN (not iinet). Why is NBN ‘so good’ yet the countless stories don’t support that assertion? If you aren’t reaching the speeds you want on the MAX plan, then yes, we absolutely suggest moving down to the 25/5 tier. Have a chat to the Billing/Support teams about this, as they’ll be able to facilitate the move for you. I would really be interested in seeing how these problems are so much of a big deal. When I moved to the Gold Coast NBN wasn’t available so I had to use Fuzenet Broadband which is delivered via Microwave to a private non-Telstra MDF and I consistenly get 100/55 even during peak. The NBN network is definately doing something wrong if they can’t compete with a Microwave connection which supports my whole building at the same speed……all I’m hearing is excuses. So you can be on Basic, Boost or Max and STILL receive the same speeds? No wonder there are so many complaints. The answer is simple, scrap the tiers and just have ONE service. I to am not prepared to switch to the new NBN when it comes my way in October. I will hold it for as long as possible, think this has been a total farce. The government should have taken stock of all the variables first instead of going for the cheapest solution that clearly fits not work. Shameful compared to many parts of the world but as usual it comes down to politics and the people simply have to pay with our having their say. I had been India recently and they have far superior broadband than what we have and costs way less. The biggest scam here is the advertisement of speed. Pay close attention to this – Speeds upto 100mbps. This is day light robbery. Even if you are sitting right inside the network provider’s exchange, this is impossible to obtain. None of the customers stay inside the exchange and hence this is a loop hole these internet service providers use to scam the unsuspecting consumers. Even if your house is located a few metres from the exchange, your realistic speed is not what is as advertised and is not even close to what is advertised. If we as consumers complain about the speed, the service provider can escape from any such complaint in any court citing various stupid reasons as mentioned in the article. It’s a shame to say that we have such poor internet connection in a developed country like Australia. Bought to you by recycling copper which is actually worse than the current copper connections. Where they can’t even still guarantee what you pay for. There is no such thing as an NBN. Just snake oil scams finding ways to keep peddling that scam. Between , is still up to. Meaning they cannot garuntee what you pay for. And still upsell you a connection as a fibre connection. This is a massive organised crime scam. Covering up the Liberals dangerous copper experiments. Fully engineered by the ACCC. How is this incentive for me to move from my CONSTANT 100mbps cable connection for $88. To massive unstable congested mess HFC NBN for $100. Where I will never see 100mbps ever again even with a very fast and stable router. 1. I can’t be assured of the change over time (people have gone weeks without a phone or internet connection after switching over) and my son is in his HSC year. 2. I can’t be certain that I’ll get the speeds I’m paying for despite the huge range in each speed tier. I was told by an iiNet sales rep that whilst I got 25Mbps if on the Max tier, that if I moved to the Boost tier the likely reliable speed would not be 25Mbps but could be 8Mbps which is less than what I’m currently getting on ADSL. You don’t need to move to NBN right away, so you still have time to consider your move and understand what product you’ll be eligible for. Regarding speeds, we aim to have you connected as fast as possible for each speed tier, but we do also stress that there are some factors that may influence this. iinet are fine, unless anything needs to be changed. My experience going to Broadband with this mob was an absolute joke. They typically promise the world but rarely deliver. I am only still with them as I am on a contract which costs heaps to break. Do not trust them at all! Particularly when having to deal with their South African section. Hopeless! 1mb upload is the stone age. That should not even be an option as a plan. Why are nbn speeds listed as up to… 1 reason, appalling delivery of infrastructure. Should have been delivered as FTTP, end of story. We basically paid millions of dollars for ADSL 3. I am trying to find out how I can increase my upload speeds in order for me to watch live streaming from the US without the buffering. I can see in the blurbs that it goes to a maximum of 40Mbs and currently I am at 4.5Mbs. The speed I need is around the 25Mbs according to 247Livestream. Any ideas? Your upload speed should be much higher, so this suggests an issue with the service. Give Support a call to discuss this, as they’ll be able to help with troubleshooting to pin down the cause of the upload speed issue. Whilst this is for FTTP, the principles remain the same. After reading these comments, i decided to post as you typically only hear about the negatives. From my perspective the NBN is delivering exactly what it should be, this being 95mb down and 38 up. Hopefully Murphy’s law doesn’t bite me. I too have a cable service which I receive up to about 4 times faster than a SLOW ADSL2 . Just looking at the different NBN plans I certainly will not make a change to NBN untill I am forced to . The way it is structured sounds like a slow dial up which we all used since the year dot . Yet another Telco failing to acknowledge that modem/router hardware is a serious problem. ISP modems are fine if you just want to check your email and do some light browsing. I went through several ISP modems having constant slow speeds and drop outs. A $400 modem/router now means that I can stream 3 x FHD streams all day long with bandwidth left (25mbs connection), dropout free and without loss of speed. NBN ISP’s are not being honest with us about the quality of their devices. If they cant handle the average home’s 9 connected devices now, how will they perform in 2020 when this is expected to be 29? To respond, we understand your point, however RSP’s also have to consider what they can reasonably offer at a set price point. Not everyone can afford a $400 router and the hardware RSP’s supply has to serve multiple roles without being incredibly expensive, yet still provide the service needed. The majority of our customers are happy with what we offer, especially at the price. * Running through comprehensive troubleshooting to diagnose a fault within the network. I do hope iiNet at least keep to their minimum range as when I first signed up with them on their NBN, on my second week of having it, speed fell to way below 1MBPS during peak hours which lasted for 4 hours, actually speed fell to more like 0MBPs as I could hardly do anything during peak hours for about 1-2 weeks. Since then it has improve and more usable now. Also, whats the point going on to Boost plan when during peak hours you will get same speed as Basic plan, and most people will be using it during this time. It appears that Fibre To The Node will be connected to your premises when the NBN reaches you. We aren’t able to estimate speeds though, as the service is still under construction and we won’t know more until the service is active in your area. We weren’t able to find any account information for you, so we’ve completed a general search. Maryborough, in both QLD and VIC are set for NBN connections early to mid 2018.
i don’t want to part with my good performing hfc service ive had since the early 90’s, 38down and 1.2 up, I’m happy with that, don’t need nbn…perhaps if dedicated HTTP at 1gig/s may consider ! We’d strongly suggest having a chat to Support about this, as there will be a strong reason why you aren’t receiving the speeds you want. At worst, we can downgrade your plan to a lower speed tier. I am currently on Telstra HFC and get >100Mbps 100% of the time and this is tested via “Google Speed Test” which eliminates most of the end server issues that are quoted by NBN and RSPs. As far as I am concerned, excusing – NBN infrastructure, NBN Signal Interference, Number of connected devices, Network Congestion during “normal” predictable high traffic times, is a huge copout. Both NBN and the RSP should be doing internet traffic forecasting and then installing infrastructure to match forecast demand BEFORE it occurs. This is not rocket science and has been used in the telephony and data industry from day 1 and it is now a well documented process. I had an NBN Engineer (I use this title as it was how he identified himself!!) try to tell me that they have “no idea” how many customers they will connect so had to wait till congestion occurred before they would do infrastructure augmentation. I am an ex-Telstra Engineering Manager and I find the dumbing down of the technical support areas criminal when they are taking my money. I will not leave the non-NBN service till the last moment as right now I get a “guaranteed 100Mbps download” service, why would I voluntarily move to a service where it is 12 – 100Mbps? Further customers are now faced with the finger pointing of two organisations, NBN and the RSP, if you report a problem. We are due to be hooked up to the NBN via HFC in October, but to be honest, I am not all that excited about it. There are too many unknowns for me. We live about 250 metres from the exchange so have a really good ADSL2+ profile and the speed is consistently around 15/1 Mbps, which is great, considering. I’m afraid getting the NBN is going to break everything. If only they had stuck with FTTP. I have been on NBN with iiNet for over a year. It started off delivering the promised speeds but has been reducing ever since. Over 3 months ago I was getting 3-4 Mbps download on a 25 Mbps plan. I have been complaining to IINet weekly for over 3 months and they have done nothing. Usually closing the task without any action or contact being made outside of the contact time frame window. Ie I’m at work. My download speed has been at low as 1.4 Mbps and even my upload at the time was over 3 Mbps. We’d suggest asking staff to assist you with completing speed troubleshooting so we can lodge a fault with engineers to have this diagnosed. You can keep using your dongle until the service is no longer offered by your current provider but it is likely that the NBN will be rolled out to your premises at some point. Don’t make a move just yet – instead, consider your options and what you currently do with your service. As you have Foxtel, you may need to see if its connected by the Foxtel/Telstra Cable network. If so, this is likely to be taken over by the NBN. I am on iinet’s 100Mbps plan and the best speed I get is 35Mbps. While I believe that speed is probably good enough for my purposes, I object most strongly to paying for a service that only provides 35% of what I pay for. I took this up with your support people, and was told that NBN had advised them that 35Mbps was the best I could expect. I put it to support, that if I changed down to the 25Mbps, which would also serve my purposes, could I expect the full 25Mbps that my connection has proved it can carry. I was told (in writing) that if I changed to that plan then all I could expect was 10 to 14Mbps due to my distance from the exchange. With all due respect, that answer is Horse Feathers. Either iinet or NBN is shaping download speeds deliberately, and hiding the fact by coming up with garbage excuses. I put it to iinet/NBN that if I have the equipment and line quality that has demonstrated an ability to handle speeds of 35Mbps, why, if I change to 25Mbps why will I only experience speeds of 5Mbps. I believe, in that case, I have a have a case in consumer law for not receiving a service I’ve paid for, and which you have demonstrated you are able to provide. A straight out question. Why are you shaping speeds on the lower tier plans? Thanks for bringing this to our attention. We don’t shape services, however where we may have congestion issues, you may see service performance reduced. In those areas, you may see speeds drop but once the issue has been resolved, speeds should return to normal. To answer you question – we aren’t shaping speeds on lower plans. Moving forward, you are best to discuss this with Support – if we aren’t able to provide the required service, then you are within your rights to request appropriate actions/solutions be offered to you. I used to have a cable connection in Ellenbrook, WA. I the network was installed (badly) by the developer and taken over by Telstra. I it was fast most of the time but dropped out constantly, especially in wet weather. Telstra eventually unofficially advised me it was a crock and to switch to ADSL. I did and never looked back. I am now with Iinet. However I NBNCo is planning to reuse this network and force us on it as a monopoly service. I have twice written to them to ask if they have repaired the network and what guarantees they will offer if the problems are still there. I have I have yet to receive the courtesy of a reply. This does not bode well. I’d like to make the following points in reply to your response. 1. I am not experiencing speed drops due to congestion. I am experiencing 32-35Mbps rock solid download speed 24/7. 2. If my system, copper wires, distance from the exchange/street node can handle 35Mbps on the “up to” 100Mbps plan, what is the reason for delivering 10-14Mbps on a lower tier? That is selling a service you are perfectly able to provide, but not delivering. To me, that’s a breach of consumer law. I’ll ask the question again. Why can you only deliver 10-14Mbps download speed on the 25Mbps plan? Copper wires, distance from the exchange and congestion, have been proved to have no bearing on this. 3. Discuss this with support. If only I could. Firstly, I have great difficulty understanding your support personnel due to their very strong foreign accents, and secondly, I like to have a written record of these conversations to refer back to if required, therefore I address all my support requests via email. I submitted an email request about 3 weeks ago, and the answer I got trotted out the old “distance from the exchange” excuse, so I can only conclude that iinet do not care, and have a store of rubbish excuses to cover their shorcomings. Thanks for taking the time to respond. In your case, we’d recommend having a word to our NBN team about this via 1300 455 806. They’ll be able to go through this with you and address your concerns. We may need to complete further speed troubleshooting, but from that point, we can then lodge a trouble ticket with NBN if we believe the issue is within their network, or pass this to engineers if we believe the issue is on our side. anyone remember Malcolm Turnbull assuring all who would listen just how great the NBN would be when he was having a ‘Look at me moment’ when wearing a different hat, like most things he spouted it didn’t happen!! I have been with iinet since they took over AAPT and I have seen the service go slowly down hill mainly due to the fact that one cannot understand the support personnel and when they can be understood they always try to blame my equipment for any problems I have. It appears to me that they are reading a set of answers off of a piece of paper as they have no idea what they are talking about, for instance I was consistently getting download speeds of between 25Mbts and 23Mbts then suddenly on 07/06/2017 the bottom fell out of it and speed now varies between 5.4Mbs and 4Mbs.This looks very much like shaping to me and FYI I have speed test records going back many years as the tests were set up to run automatically and the test logs have been kept. Hello Bernard, there are a number of factors that can affect Internet speeds and in order for us to identify what the problem is there are troubleshooting steps that we perform that will allow us to narrow down the possible causes. If you continue to experience issues with your connection speed I would recommend contacting our support team on 13 22 58 so that we can provide further assistance. Hello Mark, speeds on the NBN (or with any Internet connection) can be affected by multiple factors, ranging from a potential problem on the line, to the equipment being used within the home (modem etc). If you are continuing to experience issues after troubleshooting has been performed with our support team we can look at lodging a fault with NBN for further testing. If you haven’t already I’d recommend contacting our support team on 13 22 58 for assistance. Everyone is blaming the nbn for their speed issues. The orginal rollout plan for nbn was ftth to the majority areas and with certain regonal areas getting fixed wireless or satelite. The change of government has caused THIS MESS of mixed technology that has caused the issue. Blame the government for their lack of vision and inderstanding. Who in their right mind thought that copper is goos enough to todays internet needs. I was lucky enough to get ftth and am getting 96/45 for my service. I have freinds that are getting fttn and fttc. I would be intrested on what they will get with their services. I also blame the isp for some speed issues such as congestion during peak times. The isp controls their connection on the nbn. If not impemented properly then whos to blame. For example nbn owns the freeways with inlimited lanes, and the isp buy lanes on that freeway to use, If they dont by enough lanes to run their services then whos fault is that. Not nbn. In the end if you want this fixed and fixed properly petition the government to revert to the ftth model and do away with the monstrosity that is being created. I am trying to find out how I can increase my upload speeds in order for me to watch live streaming from the US without the buffering. currently I am at 4.5Mbs. The speed I need is around the 25Mbs according to 247Livestream. You don’t need a high UPLOAD speed – you need a high DOWNLOAD speed and you probably already have that. You will probably also still get some buffering when streaming things from the US because the data is coming from so far away no matter what YOUR download speed is. I was surprised to see that with my NBN FTTN connection I can stream Netflix with no buffering at all (or only very rarely) but I still get lots of buffering on you tube. The problem is not MY connection – but the You Tube service. The biggest problem with the NBN is mis-information about what to expect. The second biggest problem is that many people are complaining about slow NBN speeds to their WIFI connected device when the speed restriction is probably caused by their WIFI connection. Where possible connect a laptop or desktop computer with a category 6 ethernet cable and THEN test trhe speed on that device. If you battery backup your connection and there is a power failure in your street or town your speed goes to zero on all systems excluding fibre to the premises and the new Fibre to the curb. The Fibre to Node and HFC cables require electricity between the exchange and you. Fixed Wireless and Skymuster satellite systems have no backup at their tower/ground stations. This leaves Mobile broadband/phones, are the 3 telcos providing backup on every one of their thousands of towers? Remember the old phone, it has battery backup at the exchange which powers the phone! I am paying for a boost plan but in reality I never get above 10MB/sec. My neighbour is with another company gets very close to what he is paying for. I believe that iinet has oversubscribed in my area so I can’t wait to ditch them when my contract runs out. I am thinking of making a formal complaint to the ACCC and the ombudsman but I know it won’t do anything other than give me an opportunity to vent frustration. Hello Kevin, I’m sorry to hear that you’re experiencing issues with your NBN connection. Should you continue to experience slower than expected speeds I would recommend contacting our support team on 13 22 58 so that we can troubleshoot the connection and work towards identifying and resolving the problem. Your installers need to read the manual. LINE OF SIGHT is required for Fixed Wireless. A client upgraded and has no usable service now because the Tech told her the service would be ok. Her perfectly good ADSL was disconnected, her copper phone line cut and now she is having to go to the Communications Ombudsman. I called about my own property and was told YES service is available – a 100m hill is between me and the tower!! Happy for those who do have line of sight or FTTN. Hello David, if there is an issue related to the installation of an NBN service I would recommend advising your client to contact our support team on 13 22 58 so that we can follow this up directly with the wholesaler. Concerning to hear this was your experience, Brian. We would recommend getting back in contact with our Support (13 22 58) team and requesting to speak with a Senior or Customer Service Manager so we can continue working toward a resolution with you. Can you please provide a link to where I can ascertain the speeds at which the plans typically operate during the busy evening period for my area. Please don’t explain the many factors that affect network speeds – we have all read the various blogs detailing this. Just show me where I can see the typical speed I can expect during the busy evening period as per the ACCC recommendations that you now follow. If you cannot do this, please amend the opening to this blog to indicate that iiNet is NOT following the ACCC recommendations. We hope to have these details up on the website shortly, so please keep an eye out! It’s very dissappointing to see that the 100/40 plan can only provide Between 12 – 100Mbps downloads, 1 – 40Mbps upload. What the heck? 12 is supposed to be your lowest plan. I am getting consistently under 50, which is very disappointing, but it’s workable for now. What I would like to know is whether IInet are taking any actions to improve this ridiculous gap? You’ve raised a very important point here. We’ve advertised speeds as being between 12-100Mbps/1-40Mbps on the 100/40 plans (and have done the same for the other speed tiers) so that customers can have a realistic expectation of service levels, especially as speeds are very much variable on Fibre To The Node and Fibre The The Basement connections. These connections use the old copper networks in the street and buildings and therefore are subject to a lot more variability in performance. Like ADSL, the further away from a Node you are and the more variable the condition of the copper, the greater change in performance will be present. As a result, we’d rather be upfront and state what could be expected, rather than otherwise. We’re always reviewing our plans and looking for further improvements or tweaks we can implement, so keep an eye out. Just be honest about the contention ratios which typically dictate the worst case speeds (CVC purchased by RSP per client). NBN design can limit the maximum performance but often it’s the severe dips related to 100:1 contention eg. every 1000Mbps of customers get to share 10Mbps. NBNco charge a fortune for RSP bandwidth and connections. Retail price competition and limited plan complexity has led to poorer performance. NBNco should cut prices and specify a minimum CVC so we get 4x bandwidth for the same money. NBNco should also combine total CVC bandwidth instead of CVC per service area. “Unlimited” and no “time-of-day limits” mean there is no incentive for using available off-peak bandwidth instead of during the peak times. Microsoft et. al. software updates and game downloads have increased the load. Streaming video can easily use 6Mbps which easily swamps purchased CVC bandwidth (16.5:1 for 100Mbps, 4:1 for 25Mbps). We need options to have improved minimums. Our current ADSL2 connection uses old copper and >4km from exchange is 85% of that limit. If I am on a MAX plan, and speeds up to 100MB were advertised at the time I signed up, and I have only got at best 33MB (and you have no 50MB plan on offer), am I able to end my contract without penalty? I want the max speed I can get but I am overpaying for what I am receiving. I am a FTTN install and the lower speeds are not iiNet’s fault but my distance from the node. So asking for technical support to try and improve my speed isn’t going to help me as this is a network design issue. We’d encourage reaching out to our Support (13 22 58) team, Allen. A Customer Service Representative will be able to review the connection performance and your request. Changed to NBN recently and it is just a load of CRAP. Obviously IINET has not purchased enough bandwidth. We’re sorry to hear you are having trouble with your connection performance, Stephen. We have a series of troubleshooting steps that can be completed to escalate and investigate the matter for potential congestion. Our Support (13 22 58) team will be able to walk you through this and look to resolve. Well I’m new to Iinet, and have wireless NBN via satellite. I’m on a 5mb to 25 mb plan, but in the evening my download speed is between 1.5 to 2.5 mb, which quite frankly is appalling. After spending 2 HOURS on the phone to support who assured me they could fix the problem my speed is just as slow. Now I have to go to the ombudsman just to get out of this 2 year contract with these jokers to avoid a penalty for early termination, when in reality I should have all of the money I have spent to date refunded as they haven’t even met the minimum speed stated on my speed boost plan. We’re sorry to hear you felt this was your only option, Steve. If a complaint has been lodged with the Telecommunications Industry Ombudsman (TIO), a Case Officer will be assigned and in contact to discuss shortly. All well and good to be saying a case officer will be assigned, but if you can’t deliver even minimum speeds why do you state them? This whole NBN. Industry is a joke, and very unfair to consumers. Speed issues are very frustrating, so we do always recommend completing the speed testing requested. Do what you can, as the more information we have, the more we can use when we raise this either with engineers or with NBN directly!